Dielectric liquids are used for insulation and cooling purpose in all electrical equipment. Transformer is the essential equipment in power generation system. From earlier days, the mineral oil is used for dielectric liquids. But mineral oil has poor biodegradability. It produces hazards to environment. It is not environment friendly. Due to this drawback of mineral oil, environment friendly vegetable oils are used for an alternate dielectric liquid. For this work, palm oil has chosen for the experiments. Investigations of various parameters like Breakdown Viscosity (BDV), Viscosity, Flash and fire point are done according to their standards. From the experimental analysis, the properties of palm oil are compared with standards. The average breakdown strength of palm oil is higher than mineral oil. Comparing the experimental result, cost and availability, the palm oil has selected for blend with mineral oil. The values of breakdown voltage, viscosity and fire point are presented. The transformer efficiency is better by using palm oil. The results showed that the combination of mineral oil and palm oil enhanced the breakdown voltage. The Antioxidants are used to improve the properties of palm oil mixture. Interpolation functions are calculated with different concentration of antioxidants. Breakdown voltage, Palm oil, Viscosity, Fire point, Mineral oil, Antioxidants. Basically, dielectric liquids are two types. They are natural liquids and synthetic liquids. Synthetic liquids are petroleum based products. In most of the electrical equipment’s synthetic liquids are used. Because of their wide availability, low cost and better properties. They have god electrical and chemical properties. Due to their environmental worries, steps have been taking to replace the mineral oil with natural products. For the replacement, we have to check the physical, chemical and electrical properties of natural esters. In this work, the properties of mineral oil and palm oil are discussed. Palm oil is basically produced from the seeds. From the study of previous work, the research has been carried out for comparison of dielectric and chemical properties of vegetable oil with transformer mineral oil [1,2]. The palm oil is derived from the fruit of the oil palms. It has high beta-carotene content. So the colour of the palm oil is reddish. Many types of palm oil are available. That are crude palm oil, RBD (Redefined, Bleached and Deodorized) oil etc. The origin of palm oil is Indonesia and Malaysia. The basic major component of palm oil is Triacylglycerol (TG). Overall 95% of palm oil contains glycerol components with three fatty acids. At normal condition, the palm oil is semi solid state. So the viscosity of the palm oil is high. Figure 1 shows the general and chemical structure of palm oil . 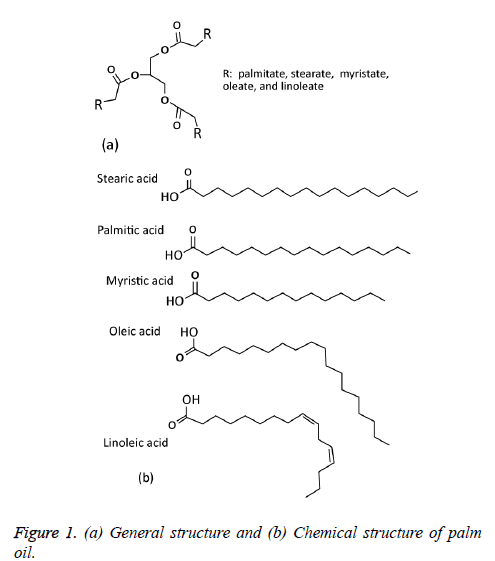 Figure 1: (a) General structure and (b) Chemical structure of palm oil. Antioxidants are the compounds which delays or slow down the oxidation process . To avoid the oxidation process of oil and peroxide formation, the amount of free radicals should be minimum quantity. The main properties of antioxidant in oil are free electron scavenging, metal chelating and synergism . At normal temperature the performance of antioxidant is rich and the temperature increases its percentage moderates [6,7]. Antioxidants are frequently used in combinatorial modes in two or three compositions for being advantageous of their parallel mechanisms. Basically, antioxidants classified as three types. They are natural antioxidants, secondary antioxidants and synergists. The types of antioxidants are displayed in Table 1. The synthetic types of Antioxidants are used for this work. Table 2 represents the selected antioxidants after careful analysis. The chosen antioxidants are used to prepare the samples. The Experimental procedures include measurement of Breakdown Voltage (BDV), viscosity, flash and fire point parameters. For breakdown voltage measurement, breakdown voltage kit is used. Breakdown Voltage (BDV) test is carried out as per IEC 60156 Standard . The breakdown kit contains two electrodes immersed in the oil which to be tested. The gap between the electrodes is adjustable depends upon the gap spacing. High voltage AC supply is slowly increased at a rate of 2 KV/s until the breakdown occurs. This test is carried out for the samples, at different electrode gap distances and corresponding breakdown voltage is recorded. Viscosity measurement is used to know the fluid friction. It is important to ensure the viscosity of the oil to be as low as possible to avoid the affecting the cooling efficiency of the transformer. In this research work, viscosity of the oil sample is measured by using Redwood viscometer . In order to improve the efficiency of cooling of the insulating fluid, viscosity of a dielectric should be low. Hence, the viscosity parameter needs to be improved significantly for safer operation of power transformers in the presence of a vegetable oil based dielectric fluid. Flash and fire point is measured by using Pensky- Marten’s closed test setup . High flash point is important for any dielectric fluid for safer operation of transformer. Flash point means that the mixture of oil vapours with air at high temperature. The value of flash point must be greater than 140°C for a good insulating fluid. Fire point is the maximum withstand temperature to produce fire. It should be high for dielectric liquids. The mineral oil and seed oil like palm oil are used for this investigation. These oils are heated up to temperature of 100°C to remove moisture. Then the oil is taken to room temperature and the properties are measured according to standards, which showed in Table 3. Table 3: Properties of base fluids. The mineral oil and palm oil mixture is used for this experiment. The mixing ratio of palm oil and mineral oil is shown in Table 4. The Samples were prepared for the volume of 500 ml. The mixing process is done by magnetic stirrer. The temperature of the magnetic stirrer was maintained constant at the time of mixing. The properties are measured as per standards . The base fluids (1, 2 and 3) are mixed with high performance synthetic antioxidants. For measuring the efficiency of antioxidants in base oils, two concentrations are used, One in 1 g composition and another in 5 g composition. The critical parameters of the samples are measured as per standards. The breakdown voltages of the samples are measured at room temperature as shown in Table 5. The results before and after adding antioxidants are compared using recorded data, the possible mechanism and individual properties of antioxidants are discussed. Table 5: Properties of mixtures. A 500 ml volume of base fluid samples are taken in a beaker and heated using heating chamber to a temperature required to dissolve the antioxidant from Table 2. Then the required quantity of antioxidant in individual is added to the heated oil. The temperature is continued to the melting point of antioxidant until the antioxidant dissolves completely in the oil. The oil is transferred into magnetic stirrer unit and 750 to 800 rotations per min (rpm) are maintained for 30 min. Then the oil is transferred to measuring unit. For the experiment, 75% palm oil and 25% mineral oil mixture is taken as base fluid-1, 50% palm oil and 50% mineral oil mixture is taken as base fluid-2 and 75% mineral oil with 25% palm oil is taken as base fluid-3. The samples are prepared by adding different proportion of antioxidant into base fluids and mixed using magnetic stirrer. The samples prepared are given in Table 6. Table 6: Samples prepared by adding antioxidants. The Breakdown voltages of all base fluids are recorded in Table 7. The antioxidants like BHA (Butylatedhydroxy Anisole), BHT (Butylated hydroxyl Toulene) and PG (Propyl Gallate) are analysed at 1 g and 5 g concentrations with base fluids 1, 2 and 3. The results show that, the base fluids had good dielectric strength. The results of breakdown voltages of base fluids at room temperature and pressure, base fluid 1, 2 and 3 show increment in breakdown voltage with increasing the concentration. In addition to that, the natural esters treated with antioxidants regain its dielectric property quickly after breakdown. The enhancement percentage of break down voltage property is given in Table 8. The breakdown characteristics of base fluid 1, 2 and 3 with each antioxidant are shown in Figures 2a-2c. Figure 2: (a). 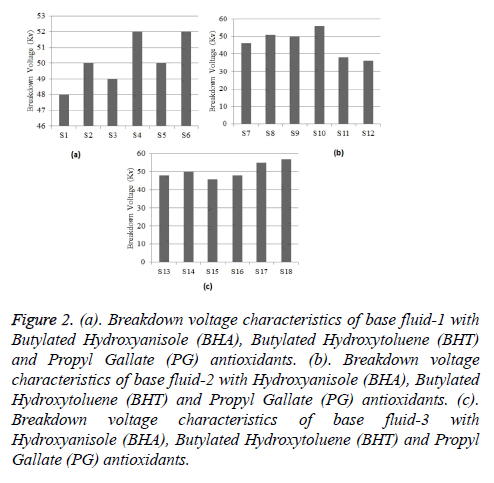 Breakdown voltage characteristics of base fluid-1 with Butylated Hydroxyanisole (BHA), Butylated Hydroxytoluene (BHT) and Propyl Gallate (PG) antioxidants. (b). Breakdown voltage characteristics of base fluid-2 with Hydroxyanisole (BHA), Butylated Hydroxytoluene (BHT) and Propyl Gallate (PG) antioxidants. (c). Breakdown voltage characteristics of base fluid-3 with Hydroxyanisole (BHA), Butylated Hydroxytoluene (BHT) and Propyl Gallate (PG) antioxidants. Table 7: Breakdown voltage of samples. Table 8: Percentage of change in breakdown voltage of samples. Viscosity is used to determine the heat conventional rate of fluids. The viscosity is inversely proportional to temperature . The saturated fatty acid fluid exhibit higher viscosity and the unsaturated acid fluid exhibit lower viscosity. The viscosity of base fluids 1, 2 and 3 are higher than mineral oil . Viscosities of base fluids are displayed in Table 9. The viscosity characteristics performance chart is prepared and shown in Figure 3. From the results, it is inferred that, all samples of base fluids with antioxidants shows better improved viscosities shown in Table 10. The viscosity of base fluid 1, 2 and 3 with antioxidants shows good values. The temperature of this decrement is due to high distribution of additives in base fluids. At higher temperature, the viscosity of base fluids decreased. Such elevated temperature could cause peroxide formation, and results in higher sludge in fluids, but the effect will be less evident in the presence of antioxidant. Figure 3: Viscosity characteristics of base fluids 1, 2 and 3 with antioxidants. Table 9: Viscosity of samples. Table 10: Percentage of change in viscosity of samples. From the experimental results, it shows that the base fluids 1, 2 and 3 give better flash and fire point characteristics. The graphical representation of flash and fire point property is shown in Figure 4. The percentage enhancement of flash and fire point can be calculated similarly to viscosity and breakdown voltage. The thermal stability of antioxidant is high at higher temperature. All the antioxidants help to protect the oil from the effect of heat and oxygen during heating. The strength of antioxidants to protect oil depends on the fatty acids present in base fluids. Samples prepared with antioxidant Butylated Hydroxytoluene (BHT) are thermally unstable with increasing concentration. Butylated Hydroxytoluene (BHT) added samples show higher rate of ignition mixture formation compared to other samples shown in Table 11. Figure 4: Flash and fire point characteristics of base fluids 1, 2 and 3 with antioxidants. Table 11: Flash and fire point of base fluid 1, 2 and 3 with antioxidants. The Mathematical functions associated with the characteristics properties of transformed base fluids 1, 2 and 3 are calculated by using many formulas. Here interpolation function formula is used to calculate the intermediate variation of parameters for varying antioxidant concentration within the intervals. The output function is derived from input function. The concentration variable is set as 0 g (null), 1 g (minimum) and 5 g (maximum) for each antioxidant added with base fluids. The volume and temperature of the sample set as constant. For each base fluid, the parameters like breakdown voltage, flash point, fire point and viscosity are represented as mathematical function in Tables 12-14. By varying the concentration (in g) of antioxidant, the corresponding output can be obtained. Table 12: Mathematical function of properties for base fluid-1. Table 13: Mathematical function of properties for base fluid 2. Table 14: Mathematical function of properties for base fluid-3. From the experimental works, the addition of antioxidant with transformer oil and palm oil combination (base fluid 1, base fluid 2 and base fluid 3) improves the properties of fluid. Moreover the performance of transformed fluids with antioxidant does not decelerate in efficiency at elevated temperature and less formation of carbon is observed during experiment. By keeping individual focus on each antioxidant composition, the supportive mechanism is observed when mixtures of antioxidants are used. With the help of the results, it can be said that, the combinational mode of more number of antioxidants will result in constructive outcomes. The study shows the use of fluids formed by combining palm oil and mineral oil with antioxidants in transformer applications. The operating cost is slightly high compared to mineral oil, but such drawback is overcome by factors like slow aging rate, high oxidative stability and less tendency towards formation of gases. The added advantage of vegetable oils is they have good biodegradability, which is suited to palm oil as an organic ester. In future the development and usage of dielectric fluid, palm oil could confirm complaint to environmental and safety laws. For future work the analysis of various properties like Dissipation factor, Water Content Analysis (WCA), Dissolved Gas Analysis (DGA) can be done for the above samples. Martins MAG. Vegetable oils an alternative to mineral oil for power transformers- experimental study of paper aging in vegetable oil versus mineral oil. Electr Insul Mag 2010; 26: 7-13. Rapp KJ, McShane CP, Luksich J. Interaction mechanisms of natural ester dielectric fluid and Kraft paper. IEEE Int Conf Dielectr Liquids Portugal 2005; 393-396. Reza Z, Azmi Z, Hossein AA, Amir RS, Mohd A. Fabrication of silver nanoparticles dispersed in palm oil using laser. Ablation Mahdi Int J Mol Sci 2010; 11: 4764-4770. Scott G. Atmospheric oxidation and antioxidants. Elseveir Publ Amst London 1965. Valantina SR, Neelamegam P. Antioxidant potential in vegetable oil research. J Chem Environment 2012; 16: 87-94. Krishnaiah D, Sarbatly R, Rajesh N. Report - A review of the antioxidant potential of medicinal plant species. Food Prod Process 2011; 89: 217-233. Smith SA, King RE, Min DB. Oxidative and thermal stabilities of genetically modified high oleic sunflower oil. Food Chem J 2006; 102: 1208-1213. Chandrasekar S, Gian CM. Analysis of partial discharge characteristics of natural esters as dielectric fluid for electric power apparatus applications. IEEE Trans Dielectr Electr Insul 2014; 21. Wilhelm HW, Stocco MBC, Tulio L, Uhren W, Batista SG. Edible natural ester oils as potential insulating fluids. IEEE Trans Dielectr Electr Insul 2013; 20: 1395-1401. Roberto A, Stephane A. Page, reducing environmental impact and improving safety and performance of power transformers with natural ester dielectric insulating fluids. IEEE Trans Industr Appl 2014; 50: 134-145. Santanu S, Roberto A, George F, Clair C, Don C. Comparative aging characteristics between a high oleic natural ester dielectric liquid and mineral oil. IEEE Trans Power Deliv 2014; 21: 149-158. Norhafiz A, Jasronita J, Mohd ZAA, Nazim M. Suitability of palm based oil as dielectric insulating fluid in transformers. J Electr Eng Technol 2013; 8: 742-749. Abeysundara DC, Weerakoon C, Lucas JR, Gunatunga KAI, Obadage KC. Coconut oil as an alternative to transformer oil. ERU 2001. Murugesh K. DC Mac Transformers Vikas publ 2002.